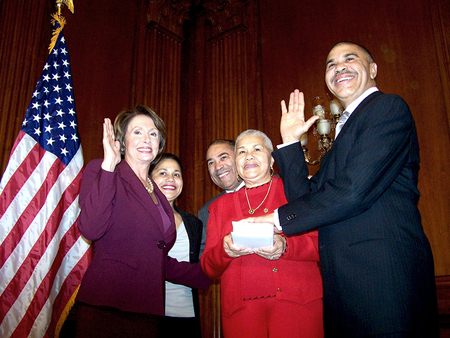 William Lacy Clay, Jr. is the son of former Missouri Congressman William L. Clay Sr., and now holds his father’s former seat in the House of Representatives. Clay was born on July 27, 1956 in St. Louis, Missouri, and was educated in the Silver Springs public schools of Maryland and at the University of Maryland where he received a B.S. degree in government and politics. He also earned honorary Doctorate of Laws Degrees from Lincoln University and Harris Stowe State University, and attended the John F. Kennedy School of Government at Harvard University. Before his election in 2000 to Missouri’s First Congressional District, Clay served for 17 years in both chambers of the Missouri Legislature. His achievements during this time include the establishment of Missouri’s Hate Crimes Law and the enactment of the Youth Opportunities and Violence Prevention Act; which created Youthbuild, a job training program for young adults. As a congressman William Clay Jr. is primarily focused on defending voting rights. He is chairman of the House Subcommittee on Information Policy, Census, and National Archives. Through this position he is an advocate for reforming the current electoral process; ensuring elections are conducted fairly and without procedural obstacles that limit minority and disabled voting, as well as expanding voter registration. He has also sponsored or supported legislation aimed at helping low income families become homeowners and restricting predatory lending practices. Clay encourages financial literacy programs in regular school curriculums. William Clay Jr. is currently a member of the Congressional Black Caucus (of which his father was a founding member), and the Progressive Caucus. He also serves on the Board of Directors of the Congressional Black Caucus Foundation and the William L. Clay Scholarship and Research Fund. He also created a statute requiring civil rights history to be included in all school curriculums.